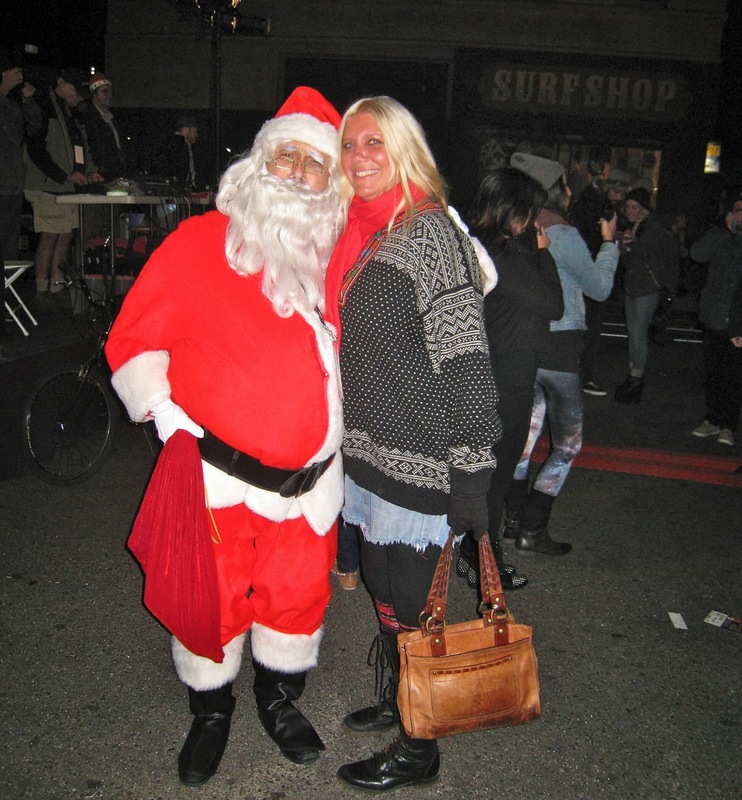 Blogtown: The 2nd Annual Venice Sign Holiday Lighting! You could have almost mistaken Venice for Bedford Falls last Friday night. As the community gathered on Windward Avenue to celebrate and behold the second annual lighting of the Venice sign for the holidays, there was such a small town, cozy vibe permeating the festivities, it did almost feel like George Bailey would come rushing through at any moment. But then you looked around and saw Tree Man, Juan in a Santa sombrero, dreaded hippies and dogs in outfits, and you knew exactly where in the world you were. There were booths set up above the Windward Circle for different organizations around the neighborhood, friends and families mingling, and lots of "Coffee" cups being carried around to combat the sudden chill that settled over Venice, brisk but adding to the holiday feeling. I don't think I've ever seen so many Santa hats being sported, so the people were feeling it for sure. Holograms of snowflakes were projected on the buildings, so we even kind of had snow. Faux flakes. First Fridays was going on over on Abbot Kinney, but it looked like all the locals knew what was up and headed over to Windward instead, as I felt like I knew just about everyone I saw. That NEVER happens at First Fridays anymore, so the night felt extra special, and for US. We enjoyed cups of egg nog courtesy of Menotti's and The Townhouse, and then it was time for the Venice Symphony Orchestra to entertain the crowd (and by now, it was a CROWD!) with holiday songs and contemporary jams alike. I love it SO much that we now have the V.S.O., and it was the first time even knowing about it for many in attendance (that must not be regular readers of this blog). Judging from the warm reception, they're here not just to stay, but to grow. I mean, how great is a holiday concert that goes from "A Few Of My Favorite Things" to "Black Hole Sun" to a medley of "Here Comes Santa Claus/Silent Night/Light My Fire/Hava Nagila"?! Something for everyone, and they were a huge hit. Conductor/Founder, Wesley Flowers exclaimed, "I LOVE this!" to the crowd as they roared for more, and I think everyone there was in total agreement. New Councilman, Mike Bonin, took the stage to shout out thanks to everyone involved in creating such an adorable community event - especially Danny/Santa Samakow, who is tireless when it comes to making sure Venice has fun. A female police officer (I didn't catch her name) was given a certificate of Venice thanks or something, and there were some LAPD jeers from the crowd, prompting Bonin to say, "With Venice, we have our peanut gallery right down front". Yep. She was a good sport, coming over to hug a heckler, which was pretty cool, and how we should ALL react to animosity, really. She said, "Venice is where everything happens." Good and bad, but tonight was all about good. Bonin then introduced the celebrity light switcher for this year, Angelica Huston. She (also in a Santa hat) remarked that moving to Venice 20 years ago was the best decision she ever made. She had been "behind her walls in Beverly Hills" and now is surrounded by friends, community and diversity, and "that's what it's all about." True story (though she's still behind big walls in the giant house on Windward that took out historic arches and columns, but that's a topic for another day). She added that her late husband (sculptor Robert Graham) always said that Venice was the one place that is unpredictable in Los Angeles, "Outside the limits, where you're allowed to be who you are." Amen, Sister. With that, it was time for the countdown and the flipping of the switch to turn our Venice sign to its holiday red and green brilliance. The lights came on and the people of Venice cheered the arrival of another beautiful holiday season. Suddenly, way up on top of the Bank Of Venice rooftop, there was an illuminated sighting of Santa Claus (Samakow) himself! Kids went nuts pointing and yelling for him - and then he was gone. He reappeared at street level soon thereafter, and all the folks in Santa hats (or Norwegian sweaters) lined up to be photographed with him. After some tunes from The Dustbowl Revival, the crowd dispersed to take advantage of all the different options going on that night. As everyone spread out and shouted their greetings/plans to friends and neighbors, you got that almost giddy feeling that comes with evenings like this (and egg nog). That everyone was having a good time, and all was well in Venice, on a not even close to silent night. Gratitude to everyone who put it on, and to everyone who went. What a beautiful time. May these holidays be merry and bright for us all! Wish I could have been there!! Much fun and community spirit'!! I wish I could have been there to enjoy the fun, the lighting and the community spirit!! Keep up the good worik CJ! !